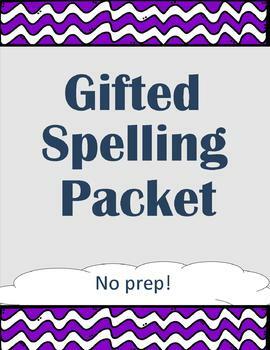 Gifted Spelling Packet - No Work for You! Do you have gifted students who constantly need adapted spelling lists? Do you find it hard to juggle between the regular list and the gifted one? Look no further! This packet requires only a few minutes of your time to setup and explain to your student and the rest of the year will be easy peasy! This packet allows students to make their own Flippity.net spelling list that emails their test results directly to you. Step-by-step directions are included for your students (and you)! Please Note: This packet was designed to be used with students who have access to a computer. It can be used without a computer, however this will require more work from you each week.